Over the summer, IINE deepened our relationship with a unique corporate partner. Life Science Cares (LSC) is an association of like-minded local bio-tech companies that have banded together to increase their philanthropic and volunteer impact in the region. In 2017, IINE was designated as one of the organization’s beneficiaries and invited to a Council of Champions Mixer at Millipore Sigma in Burlington, MA. LSC collected gift cards at the mixer that IINE used to purchase new professional clothes and groceries for our clients. 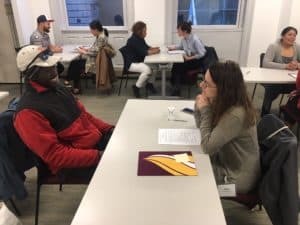 Recently LSC brought 13 volunteers to Boston participate in a “Mock Interview Night” for students participating in IINE’s evening English classes for Speakers of Other Languages. Mock interviews give IINE students the opportunity to practice their job interviewing and English skills with a local professional. Coming up in November, Life Science Cares volunteers will host a special Thanksgiving celebration for students in our Boston ESOL classes. In addition to engaging with IINE as volunteers, Life Science Cares provided IINE with a generous grant in support of our employment programs in our Boston and Lowell sites. We were honored to be among the organizations selected for support during Life Science Cares’ first formal grant-making year.